At Audi, the body is much more than a car's shell; it is a technical highlight and provides the basis for a numberof qualities. Lightweight design, precision, stiffness, vehicle dynamics, safety and aerodynamics - the brand with the four rings is far ahead of the competition in all of these areas. Low wind noise is an important comfort factor, particularly on the highway. At speeds of 120 km/h (74.56 mph), the whooshing of the wind is the loudest source of noise in the interior of many cars. Aerodynamic drag plays an important role in customers’ driving behavior. In cars such as the A8, which are used predominantly for long-distance travel, aerodynamic drag also accounts for almost half of the running resistance. Outfitted with the 4.2 FSI, the luxury sedan has a drag coefficient of 0.26 and a frontal area of 2.41 sq m (25.94 sq ft). Low lift coefficients at the front and rear axles ensure confident stability at highway speeds. The study of air flow through the engine compartment is a relatively recent branch of aerodynamics. In the new models, the area around the grille is thoroughly sealed so that the inflowing air reaches the radiator with virtually no losses instead of becoming turbulent. A car produces 40 to 50 percent of its total aerodynamic drag in and around the underbody, the wheels and the wheel arches. Audi has an excellent tool for optimizing these zones – the aeroacoustic wind tunnel. With its rolling floor and the four small treadmills on which the wheels can turn, it provides insightful and detailed analyses. According to DIN unladen weight without driver, the new Audi R8 Spyder* tips the scales at just 1,720 kilograms (3,792.0 lb); dry weight is a mere 1,612 kilograms (3,553.9 lb). 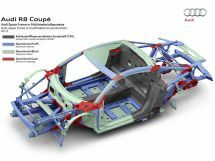 The key to this outstanding figure is the new multimaterial Audi Space Frame (ASF). 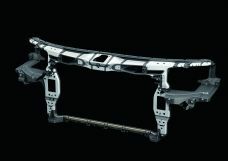 It combines aluminum components with components made of structurally integrated carbon fiber-reinforced polymer (CFRP). 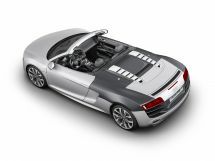 The ASF in the new Audi R8 Spyder has a total weight of just 208 kilograms (458.6 lb). When it introduced the first A8 in 1994, Audi had not only developed the radically new ASF design and put it into series production, it had also developed all of the steps required for its production. The launch was preceded by a development process lasting 12 years. Since this time Audi has built on its competitive edge step by step. The arc spans three generations of the A8 and also includes the A2 along with its legendary three-liter version, the A2 1.2 TDI. By the end of 2010 alone, the company had produced some 550,000 vehicles with the ASF body – far more than any other manufacturer in the world. The R8 V10 plus* has a dry weight of 1,454 kilograms (3,205.5 lb). The key factor behind the consistent lightweight design is the body shell with multimaterial Audi Space Frame (ASF): It weighs only 200 kilograms (440.9 lb). The resulting unladen weight of 1,555 kilograms (3,428.2 lb) leads to a superior power-to-weight ratio of 3.46 kg/kW (2.55 kg/hp). Aluminum is an excellent material for vehicle bodies. 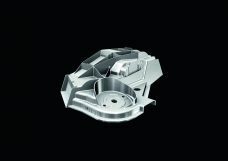 With its low density of 2.7 grams per cubic centimeter (0.098 lb per cu in), it is roughly two-thirds lighter than conventional grades of steel, and since it is a relatively soft metal, it is easy to machine. Alloys, the most important components of which are magnesium and silicon, provide the high strength necessary for vehicle bodies. A number of steel bodies from Audi, from the A1 (Combined fuel consumption in l/100 km: 7.1 – 3.8; Combined CO₂-emissions in g/km: 162 – 99)** to the A7 Sportback, comprise significant proportions of high- and ultra high-strength steels of different strength classes. The best of these are the hot-shaped steels, which stand out due to their extreme tensile strength and the resulting weight-savings potential. 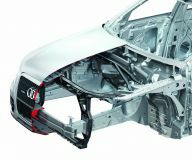 Audi is taking the development of the steel body a step further – to the Multimaterial Space Frame, which combines components of aluminum, steel and fiber-reinforced polymers (FRP) with one another. The future of this new “ultra” technology has already begun with the bodies of the A7 Sportback and the new A6 (Combined fuel consumption in l/100 km: 9.6 – 4.4; Combined CO₂-emissions in g/km: 225 – 114)**. In every development process, crash safety is of utmost priority for Audi. Each new model must comply not only with European standards, but also with the regulations of major export countries as well as strict specifications that the brand itself has defined. Cars from Audi also meet all the requirements in the event of an accident involving a pedestrian. In the A8, for example, a foam component between the front bumper and its cross-member lessens the impact on the knees. Undesired resonant vibrations in the body are strictly taboo. At Audi a great deal of work goes into preventing or minimizing such vibrations. 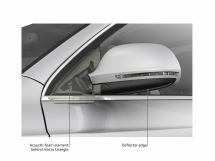 In the A8, for example, the development engineers specifically analyzed and minimized all vibration levels at the contact points between the passengers and the body – the floor panel, the seats, the steering wheel, and the inside mirror. 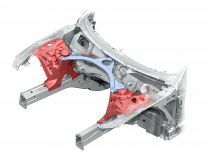 Static torsional stiffness, the resistance to torsion in the longitudinal direction, is a critical factor in determining a body’s strength and a primary consideration for each new design from Audi. In the A8, for example, torsional stiffness increased by approximately 25 percent compared with the previous model. In the TT Coupé the increase was 50 percent, and in the TT Roadster an outstanding 100 percent. Carbon-fiber-reinforced polymers (CFRP) are particularly attractive materials for the “ultra” lightweight design from Audi. The brand already offers a number of large and small CFRP components, primarily in the R8 model family. These range all the way to partially self-supporting structural components such as the side walls and the cover for the top component in the R8 Spyder. 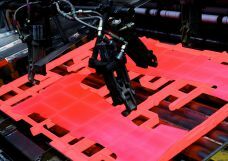 Fiber-reinforced polymers (FRP) offer many advantageous possibilities for the “ultra” lightweight design of the future. Development engineers at Audi are by no means fixated on CFRP alone. They are instead exploring all avenues.